Mill Valley and St. Thomas Aquinas will meet in the semifinals on the east side of the Class 5A bracket for the third consecutive season. Last year, Mill Valley nipped Aquinas 14-13 in the semifinals and went on to win a second consecutive state championship. In 2015, the Jaguars defeated the Saints 45-28 in the semifinal round on their way to the school’s first state championship a week later. To win a third, the Jaguars will have to go through the Saints again. The winner will meet the winner of Goddard and Bishop Carroll in next week’s state championship game at Pittsburg State University’s Carnie Smith Stadium. Aquinas beat Mill Valley in the regular-season matchup 42-21. Like last year, the Jaguars struggled through a difficult Eastern Kansas League schedule but got hot late in the season. Mill Valley began the season with a 2-4 record but enters the semifinal on a five-game winning streak. Last week, Mill Valley beat St. James Academy 21-14, avenging a 45-21 loss against St. James to open the season. Senior quarterback Brody Flaming has passed for more than 2,600 yards. Junior Logan Talley is the prime target with 78 catches for more than 1,100 yards. Mill Valley is coached by Joel Applebee, who has a 64-24 record in his eighth season. Aquinas’ only blemish of the season was a 27-14 loss to undefeated Bishop Miege. Since then, the Saints have won eight straight games. Last week, they topped Pittsburg 42-21. The Aquinas offense is led by quarterback Will Swanson and running back Cameron Jackson. Swanson has passed for 1,010 yards and seven touchdowns, while adding 546 yards and 17 scores on the ground. Jackson has a team-high 1,272 rush yards with 16 scores and is coming off of his fifth consecutive 100-yard rushing game. In fact, the only game this season in which Jackson did not eclipse the 100-yard mark was against Mill Valley when he totaled 44 yards on 11 carries. Aquinas rushed for 302 yards in the regular season meeting, but lost two fumbles – something that has plagued the Saints in prior playoff losses to Mill Valley. Coach Randy Dreiling, who enjoyed an abundance of success at Hutchinson, boasts a career record of 221-88. Last season, Goddard won this Round of 16 matchup, 20-12, a win that effectively stamped the Lions as an elite power. Goddard eventually lost in the state title game to Mill Valley, 35-34, in double overtime. This season, Goddard and Bishop Carroll have been entrenched in the top-3 in Class 5A all fall. Goddard is the classification’s lone unbeaten and owns one of the signature wins of the year with a 50-20 Week 2 victory versus Derby. Carroll lost to Derby, 54-45, in Week 5, a game when the Golden Eagles had a significant yardage edge but finished minus-6 in turnover margin. Carroll has a total margin of 448-227, while Goddard is at 480-135. The Lions lead 5A in scoring offense and defense – defense by a sizable margin. Carroll is third in points. Much of this game hinges on the health of dual-threat Goddard senior quarterback Blake Sullivan. He exited last week’s 28-13 win versus rival Eisenhower with a shoulder injury and missed the second half. Sullivan has been banged up throughout the fall. Sullivan is probable for this week. Junior Ben Bannister had 19 carries for 160 yards to lead the Lions. Eisenhower led 7-0 early before Goddard tied the game on a fumble recovery in the end zone from senior Cole Caraway. Goddard took a 14-7 lead when Bannister had a long run and fumbled, but sophomore teammate Kaeden Hoefer picked up the ball and ran it in for a score. Freshman quarterback Kyler Semrad had stepped in and played well with 36 of 60 passing for 486 yards with a 9/4 TD/INT ratio. Sullivan has completed 70 of 140 passes for 1,146 yards with a 15/2 TD/INT ratio. Bannister leads with 987 rushing yards, while Sullivan is at 982 and 21 rushing scores, easily the team high. Like last year, Goddard has forced a high number of turnovers (27) and stands at plus-11 in turnover margin. Senior Ian McSwain has picked off six passes. Senior Justin Amaro leads with 82 tackles, 15 for loss. Carroll beat Maize last week, 26-14. Senior Zachery Roth had two carries for 79 yards, including a 41-yard scoring run. 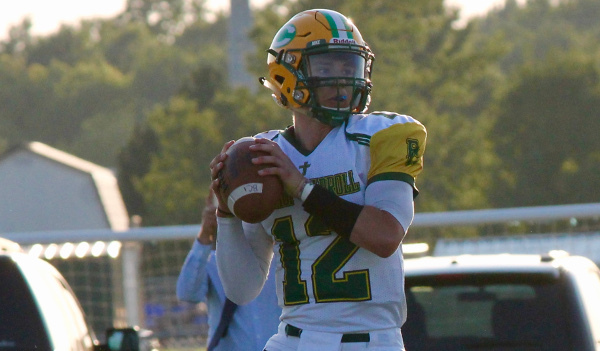 Senior quarterback Braden Howell has delivered in the passing game all year, including 315 yards and two scores last week. Howell helped Carroll throw for 472 yards versus Derby, one of many big games. Against Maize, Joseph Holthusen had 15 catches for 132 yards, and Thomas Helten had a 62-yard reception. The Lions have the defensive edge and home field advantage. As long as Sullivan plays, the Lions are the favorite.